Most of our Cymbidium species are cool growing and flower in the winter months but this species reliably flowers at the end of August. Cymbidium dayanum is a very graceful warm growing Cymbidium native to lowland forests from Sikkim in the west to Japan in the east and south through South East Asia to the Philippines and Malaysia. Plants are reported to grow low down on trunks in evergreen forests where conditions will be shaded and humid. 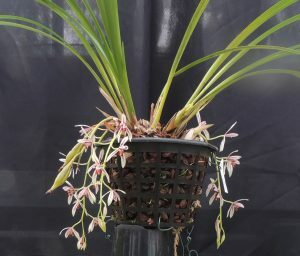 Compared to most other warm growing Cymbidium species C. dayanum has thin and delicate leaves reflecting the habitat it has evolved to suit. 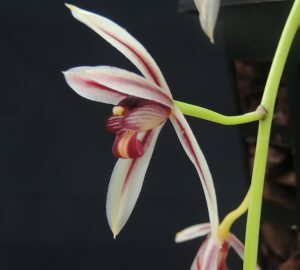 Most warm growing cymbidiums have heavy thick leaves and are adapted to cope with dryer conditions and this difference needs to be noted in Cymbidium dayanum care. We grow plants in constant shade in our Warm Asia section and keep plants watered throughout the year. Plants respond by flowering profusely as shown in the photographs and the flowers are long lasting and fragrant. The flower spikes are sharply pendulous and so baskets work well for the species.